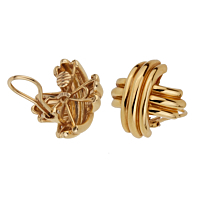 A gorgeous and classic pair of vintage Tiffany & Co crisscross large gold earrings. 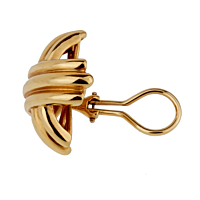 Three curved circular solid gold elements sit elegantly on three more of the same design, forming a cross like design. High polished in 18kt yellow gold, the posterior frame resembles a delicate flower.The crisscross earrings have an open loop clip and are hallmarked with the Tiffany & Co stamp.